Abstract: Americans spend billions of dollars every year in weight-loss products, diet and exercise programs, health-club memberships, liposuction, gastric bypass operations, weight-loss surgery, etc. GS related her experience with a slimming program which did not help her. Then she tried the slimming pills which landed her in hospital twice. The doctor warned her: “No more third time!” After about a total of 14 days on the herbs and e-Therapy, she lost 4.4 kg. The fat in her belly disappeared and she could wear and button up her shorts. Obesity is a term used to describe body weight that is much greater than what is healthy. An obese person has a lot more of body fat than is desirable or healthy (1). About one in six or 15% of American children is overweight (2). About 30% of adult American population, i.e. 60 million of them, are just too fat and are obese. Unfortunately the obesity rate in the US is soaring and has become an epidemic of the century (3). Obesity is also becoming a major problem in Malaysia. According to the World Health Organisation, Malaysia ranked sixth among Asian countries with high adult obesity rate (4). About 43.1% of the Malaysian adult population is overweight and obese (6). Obesity is the result of over eating and people’s liking for fast food and carbonated drinks coupled with sedentary lifestyle. In other words, obese people are not doing or getting enough exercise. Drinking too much alcohol, hypothyroidism and taking of medications such as antidepressants, antipsychotic, and steroids may also contribute to weight gain and obesity (1, 5). Obesity has been linked to a variety of chronic diseases such as diabetes, heart disease, stroke, certain types of cancer, high blood pressure, high cholesterol, metabolic syndrome, asthma, breathing problems, arthritis, gallbladder and liver diseases, urinary incontinence, depression, and sleep apnea (6, 7). Sleep apnea is a serious sleep disorder in which breathing repeatedly stops and starts. A person with sleep apnea snores loudly and feels tired even after a full night’s sleep (8). Extreme obesity can lead to hypoxemia, i.e., low blood oxygen, resulting in shortness of breath. This condition in turn can lead to high blood pressure and pulmonary hypertension. If left untreated, this can lead to right-sided heart failure and ultimately death (1, 9). GS is thirty-three years old. She had difficulties in sleeping and breathing. To us, she looked over-sized. We offered to help her. We examined her meridian energy using the AcuGraph. Then we sat down to discuss her problems in greater details, after which GS underwent the e-Therapy, starting off with Detox #1 and eventually Detox #3 and Obesity #17, daily. Based on the results of the AcuGraph, we prescribed GS two herbal teas: Bai He Gu Jin for her split Lung meridian and Bai Zi Yang Xin for low Heart meridian. Disharmony of the Lung meridian would lead to breathing difficulties and shortness of breath. Likewise disharmony of the Heart meridian can be the cause of excessive dreaming, restlessness and difficulty in sleeping. After a few days, GS told us that her breathing was better and she could sleep well. In addition, her bowel movements were good. Since she was also on the e-Therapy, we were unable to determine to what extent these herbs contributed to her improvements. Nevertheless what is important is that she is getting better! Figure 1: After taking the herbs, Bai He Gu Jin and Bai Zi Yang Xin the split Lung meridian and slow Heart meridian became normal. GS was not breathless anymore and she had quality sleep. 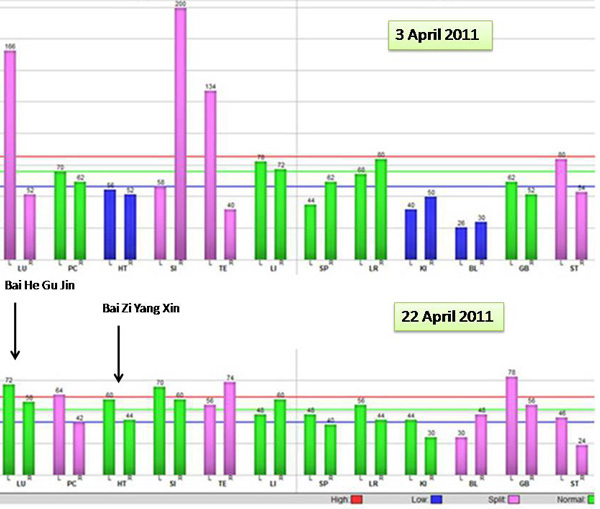 Figure 2: On 3 April 2011, her qi was 70% but energy stability was extremely low at 23%. On 22 April her qi was 52% and energy stability was within limits at 80%. 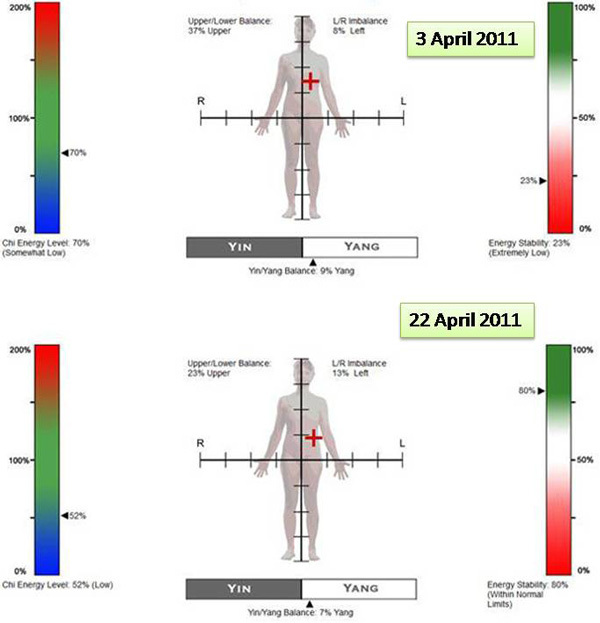 According to the AcuGraph, the qi level on 3 April 2011 was 70% and after two weeks of therapy it went down to 52%. It would appear that with a lower qi she ought to have lost some vigour and strength. The reverse is true. She has more energy. Before the therapy, there were eight meridian disharmonies. Even though qi was high, it did not promote well being. After the therapy, some meridians were harmonized resulting in increased in well being – especially the Lung and the Heart meridians. Americans spend billions of dollars every year in weight-loss products, diet and exercise programs, health-club memberships, liposuction, gastric bypass operations, weight-loss surgery, etc. They buy the latest top selling diet book or weight loss pill trying to lose weight (1, 2, 7). Some methods work, some don’t, while some others are downright dangerous. Generally these methods help initially to shed off a few pounds but only to regain the lost weight soon afterwards (1). The reason for this is simple. Regular exercise and a healthy diet are the most effective methods for weight loss and to be effective we must be fully committed to change our lifestyle and diet. Change those habits and the problem would go away. But it is not easy to change human habits (1, 2, 7). GS related her experience with a slimming program which did not help her. Then she tried the slimming pills which landed her in hospital twice. The doctor warned her: “No more third time!” Listen to our conversation below. GS always accompanied her sister, who has cancer, to our centre. Since her sister was undergoing the e-Therapy, we asked if she wanted to detoxify herself as well. We know that this would help her. It was not our intention to put her through a “slimming therapy”! As it turned out, she benefited a lot. A blessing indeed! One final message: Our mission is helping cancer patients. This is our first case helping someone with obesity and there is something we can learn from her experience. People have to restrict their food intake after undergoing “slimming programs.” The best option is to be able to eat and not go hungry all day long, and at the same time remain slim. I want to send my warmest wishes to Dr Teo on his remarkable works for people with cancer (and by default the lady with obesity). I have just embarked on a career as an Acupuncturist which is my way to impart some healing to those in need. I have always cared about people and always wanted to have an ability to help humanity and believe it has always been my destiny. Acupuncture gives me the tool with which to heal people on a Body Mind and Spirit level and I thank the Dao for finally giving me this opportunity.